"Our elegant Sparkling Snowflake design adorns one of our best selling gifts! Share some of our most popular flavors with your friends, family, colleagues, and clients by sending them six bags of our popcorn fresh from the kitchen. Each bag of our terrific popcorn is one foot long and serves 2-3 people." What we thought: Mmmm! This popcorn was tasty! Dale and Thomas makes some really yummy treats:) The flavor combinations of the popcorn was awesome! Whether you like the sweet, chocolate-y, caramel-y flavors or the salty and savory barbecue and cheesy flavors, they've got you covered. And what better way to get to try a little bit of everything than with a yummy sampler! 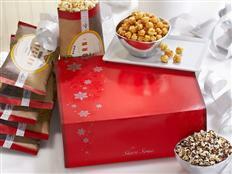 These samplers would make great gifts or treats for your holiday guests. They come beautifully wrapped too! ABCD Diaries gives Dale and Thomas Popcorn an A+!